As a homeschool mom, I am constantly printing out resources and assignments. This is on top of all the normal printing needs of our family. My husband volunteers with the jail ministry and I use coupons to save money. This means that ink costs can start to add up. I recently discovered HP Instant Ink and was amazed how much money it can help me save on all my homeschool printing. Plus I never have to worry about realizing I am out of ink when I need it the most. HP InstantInk is a subscription service that delivers ink right to your home when you need it and you only pay for what you use/need. So you are probably wondering how it works and how it will help you save on your homeschool printing. Check out the video below, read my simple steps to use HP Instant Ink, and then save with a special offer for my readers. Have an eligible HP Printer. Your printer needs to be able to communicate with HP so an eligible printer is required. If you don’t have an eligible printer, investing in a new eligible printer will help you save long-term. Find a list of all eligible printers below. (This information is current as of January 2017, for up to date information visit HP InstantInk HERE! Choose Your Plan. 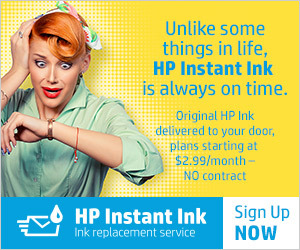 HP InstantInk offers 3 plans to choose from. The plans are month-to-month and there are no annual fees. You can change your plan at any time without any additional fees. Your monthly printing limit includes photos, black and white, and/or color. Plus any unused pages for the current month will roll over to your next month. Don’t worry about going over because you can still keep printing and pay a small fee for additional pages. Depending on your plan you get up to 25 pages (over your plan limit for only $1.) To see how much you can save ever year check out the image below. Ink Delivered to Your Door. Once you are signed up, the ink will be delivered to your door. Thanks to the communication between your printer and HPInstantInk, you don’t have to worry about remembering to order ink. The ink will be delivered right to your door. The best part is you are not charged each time ink is shipped. Your monthly fee covers all your ink. This not only saves you time but money. Plus they will send you an envelope to send your empty cartridges back to be recycled. Thanks to HP InstantInk, homeschool printing has never been cheaper and I don’t have to skimp on the color copies because I am trying to save on ink. For a limited time all my readers can receive a FREE 3 months with special promo code: INSTANT3. To take advantage of this savings visit HP InstantInk and don’t forget the promo code.